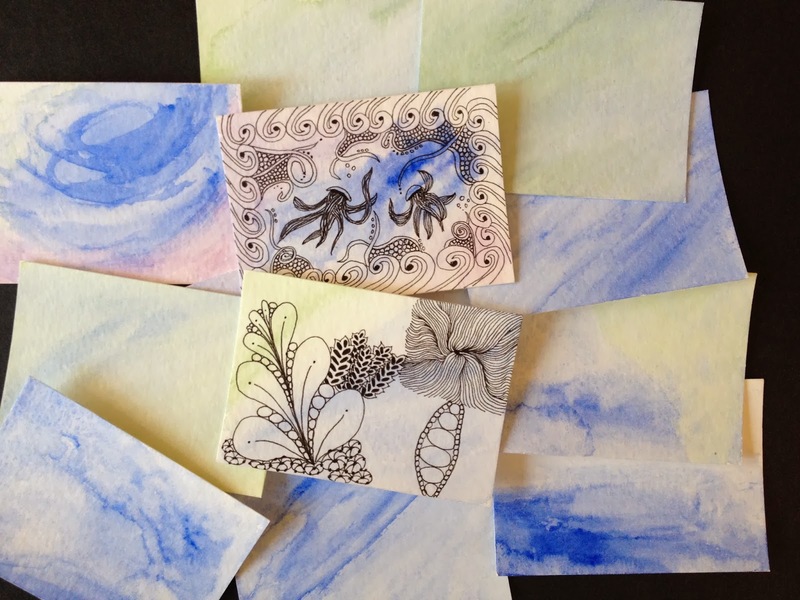 A wonderful CZT named Sharon Lynn Payne recently gave us Zentangle teachers a challenge: to create a deck of 53 Artist Trading Cards to be swapped with fellow CZTs. The Artist Trading Card (ATC) is the same size as a baseball card. For many years, artists have designed these small cards in a variety of media and traded them with colleagues, either in person or by mail. Receiving a hand designed ATC is like a acquiring a mini masterpiece; it's something to be treasured. I was so excited to join my first Zentangle swap. Not only am I looking forward to receiving 52 treasures from my talented colleagues (the 53rd cards will be compiled into a special gift deck for Rick and Maria), I'm loving the structure of creating a large scale project. I love to dream big, but following through to the end can be challenging. Seeing everyone else's works in progress (and finished decks!) online has been so inspiring. Our deadline is March 26th and I still have quite a bit of work ahead of me. But that's okay--it's fun work, and I always do best under pressure. Stay tuned to see how the rest are coming along!